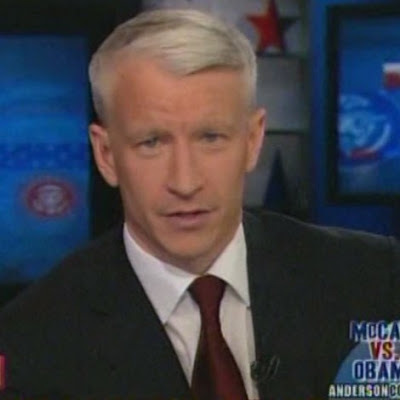 UPDATE: AC360 will be LIVE Sunday night at 8PM ET. Gustav's back...Yes, back. Do you remember in 2002 there was another Hurricane Gustav (Cat 2) that grazed North Carolina and other areas along the Eastern seaboard? I guess Gustav wants to make a name for himself this time. Maybe he'll get cold feet (or hit cold water) and do a repeat of 2002. 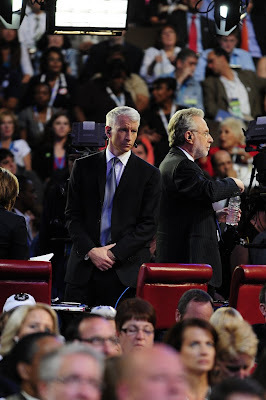 I asked Phebe to post video the other night of Anderson teasing Wolf saying "Blitzer Twitters and Tweets". 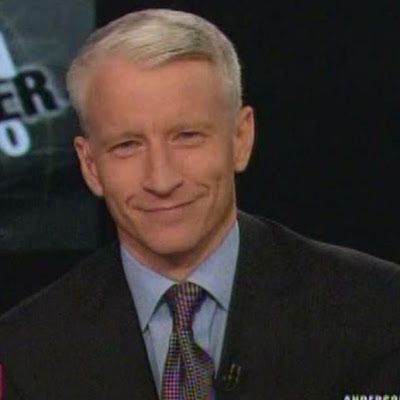 Does Anderson know he has his own Twitter account? Uhh...he does. 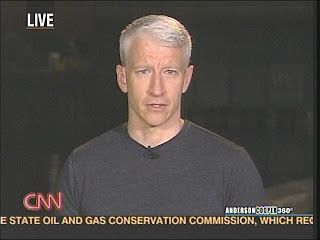 Check out http://twitter.com/andersoncooper. 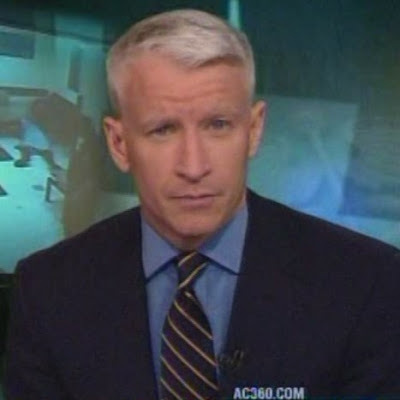 It looks like the AC360 blog uses the account to send out notifications of new blog postings. 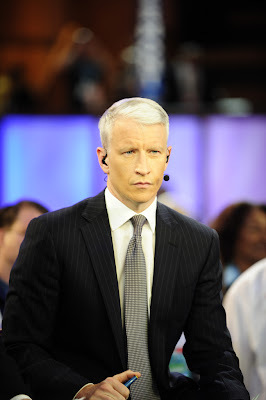 So maybe that's how some people are always first to post on the AC360 blog. 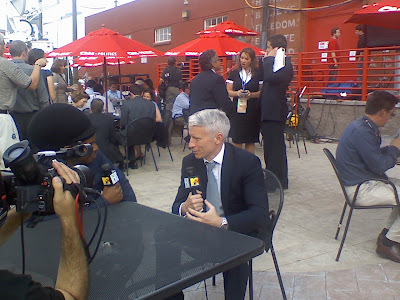 One thing I've enjoyed about Anderson reporting from the DNC is that pics, videos and encounters with Anderson pop up all over the place. Here are some more pics from Denver. These two are from one of our readers. This one is Anderson waiting to get into the Google-Vanity Fair party. Hello everyone. Long time no blog. Hard to believe it has been two weeks since I have blogged. 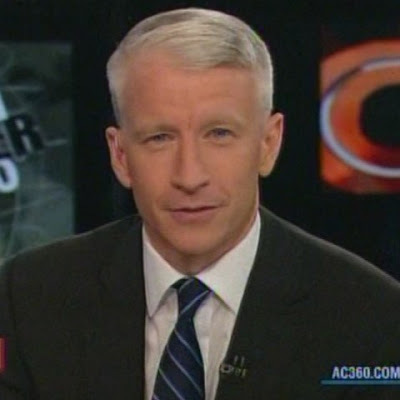 To make up for this AC 360 was on live for 2 hours Friday night to make up for the time I missed so it would seem. 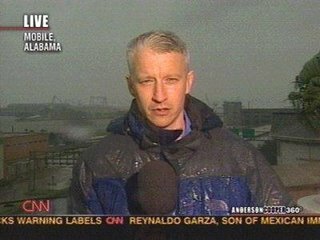 With Friday being the 3rd anniversary of Hurricane Katrina and Hurricane Gustav heading NOLA's way it probably does not surprise anyone that Anderson was live from New Orleans. Without fail a breaking news story happens while AC is in NOLA to take most of the shows focus off of NOLA and on to something else and Friday night was no exception. There is alot to cover so let's get started. One day after the Democratic National Convention ended, John McCain unveiled his Vice Presidential nominee. Alaska Governor, Sarah Palin. I know you must be thinking what I was thinking when I heard...WHO?!?!? I have seriously never heard of this woman in my entire life and in the matter of minutes, she became the name everyone is talking about(if that is not celebrity I don't know what is). David Mattingly took a look at the woman who may be the first woman Vice President. A mother of 5, a jock and a beauty queen, oh and by the way she is under investigation by her state. Now that is so good vetting but of course when you have only met the person who will be your number 2 a couple of times….who has time to know these things. I was never a Hillary supporter but if I had been I would be so insulted by McCain’s choice. I am reminded of the Dan Quayle/JFK reference. Sarah Palin is no Hillary Clinton! 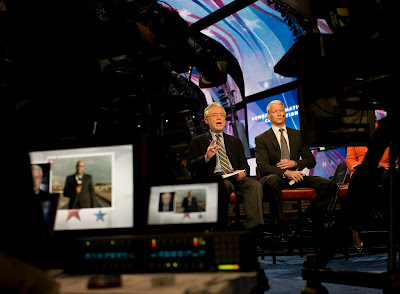 Obama – Biden responded by saying they were happy in the historic nature of the VP choice. 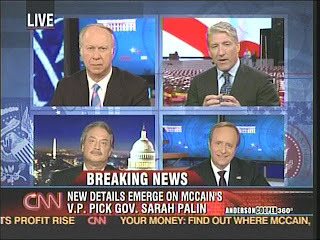 David Gergen, John King, Alex Castellanos, Paul Begala join Anderson to talk about Palin choice. 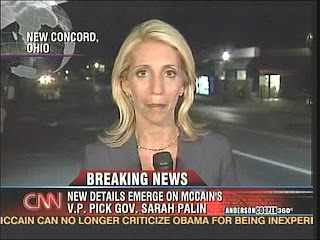 Dana Bash took a look at McCain and Palin out on the campaign trail. Watching it, I thought the two seemed so odd together. 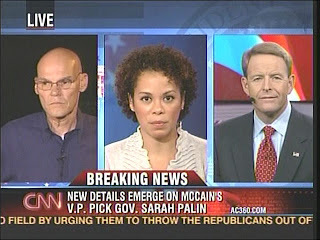 Amy Holmes, Tony Perkins, James Carville talk McCain’s choice. 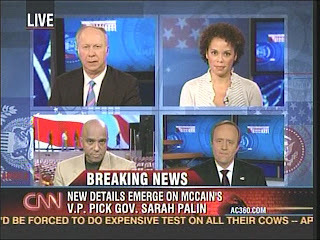 Anderson is joined by David Gergen, Amy Holmes, Joe Johns and Paul Begala. Throughout the night points made by the Gerg, Paul and James hit the nail on the head for me. Never fear McCain/Palin fans, I cannot vote so the opinions expressed in this post are that of a frustrated outsider who has no say in the matter. 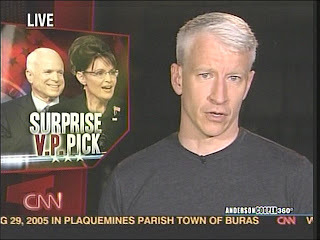 McCain/Palin is either the biggest joke in modern politics or the greatest move in modern politics. We will have to wait and see what happens in 67 days. 38 million people watched Obama’s historic nomination speech. Joe Johns went through the speech to keep Obama honest. There were a few moments that were stretched in the facts. Is a NOLA ready? – Anderson took a look at the new levees that have been built in the last three years. The work on these levees is not suppose to be complete until 2011. The levees are now 15 feet high and are set deep underground. The levees should hold under a Category 2 storm or lower. Unfortunately according to Chad Myers, Hurricane Gustav may become a category 4 storm at some point. Gary joined Anderson from NOLA to do the News and Business Bulletin and the shot. Gary Tuchman took at look at a nation divided over the Clinton/Obama supporters. A lot of Clinton supporters seemed to have come over to the Obama side. 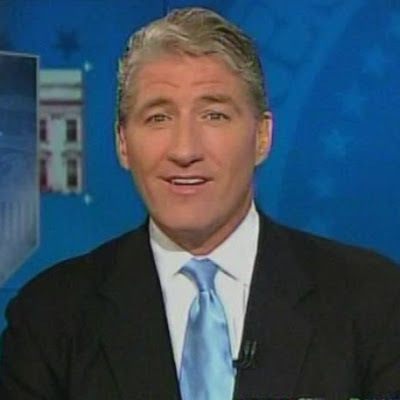 Gary Tuchman spoke with many people throughout the country during convention. In hour number 2, The Gerg, Roland Martin and Amy Holmes talk with Anderson about the Democratic Convention. 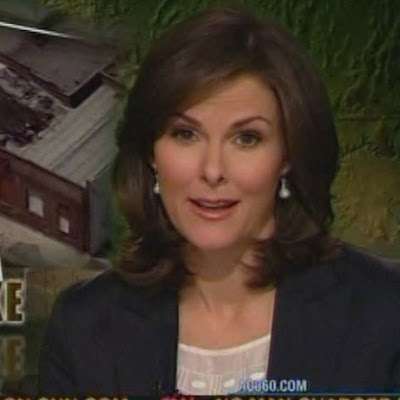 Anderson did a reporter notebook to reflect on the 3rd anniversary of Katrina. If you have not had a chance to check out the 360 blog, I strongly suggest you do. There are many blog posts related to Katrina and NOLA and all are great reads. As the Democratic Convention comes to a close I, like TBPTOT, am ready for the weekend. It has been a very emotional experience watching the speeches and the coming together of the two factions of the Democratic Party. 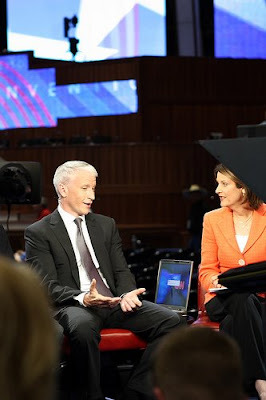 CNN did an amazing job covering the event and truly lived up to their slogan CNN=Politics. Again we are fortunate to have a lot to blog about, so let's get going. This first item was sent to me by DAFan. 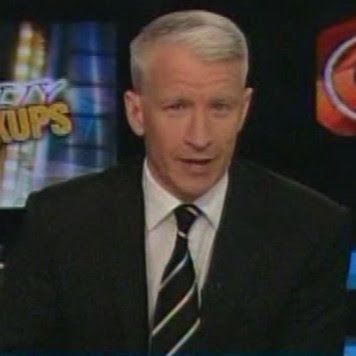 It seems that some enterprising AC fan is selling Anderson Cooper bookmarks on eBay. The bookmark is 8.5 inches tall and is made of cardboard. 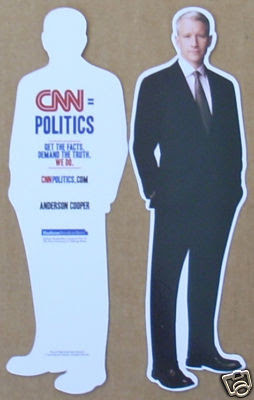 If you can't live without an Anderson Cooper bookmark just follow the link. One of our regulars, Kristien, sent us a tip that Campusvoices had posted an interview they did with Anderson on Youtube. The discussion centers around the importance of young people getting involved in the elections. Thanks for the heads up Kristien. I do not know how DAFan found this next video but she did. It is a well done video by a young man who chronicles his trip to NYC. His friends, his family and a few people he happens upon on the street. You might just recognize someone about 2 minutes into the video. Enjoy! One of our readers sent us a wonderful tip today. There is an article in the September issue of Conde Nast Traveler about Anderson and his experiences in NOLA. It is available to read online. Our tipster says the picture online (that I have posted) is only half of the picture. The other half is the table he was sitting at with his lap top and blackberry and some newspapers. The picture was taken on May 19. I know at least one reader (Quitty) would want to see AC teasing Wolf about Twitter. My clips tonight are a bit jumpy as we were having the most incredible storm during the broadcast. I thought my power would go out at any second. So forgive the jumps and enjoy the teasing. At the end of Thursday's convention coverage the Denver panel took a look back at their special memories of the week. I thought it was a fine way to wrap up our coverage too. 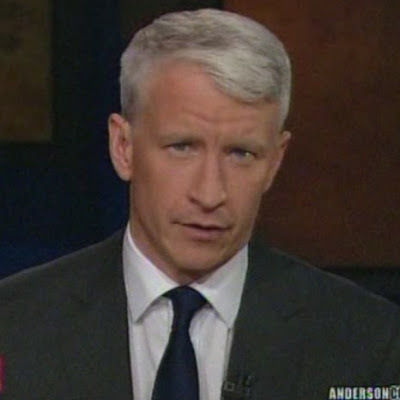 Anderson will be on live from New Orleans Friday evening. 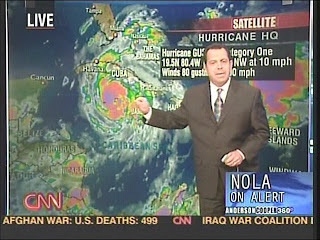 Let's all say a prayer that Hurricane Gustav comes ashore far from NOLA or any populated area. To say that Wolf enjoyed the band and the music on Wednesday night is a bit of an understatement. 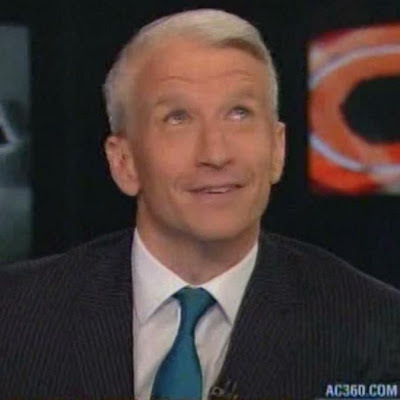 Anderson couldn't resist some good natured teasing which led the Wolfbot to reveal his deep, dark secret. 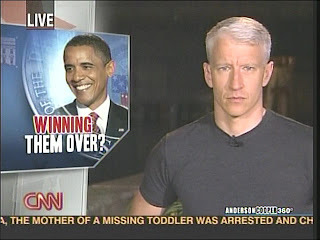 On a more serious note there was lots of New Orleans/Anderson Cooper news today. First The Congressional Roll Call is reporting that AC attended a party on Sunday night with many of the NOLA movers and shakers. The party was called 'Friends of New Orleans All-Star Jam-Balaya' and was held at the Fillmore Auditorium. Among attendees were Donna Brazile and Sen. Mary Landrieu and as we mentioned previously AC. As reported in the Roll Call "The hurricane drinks were flowing and the food plentiful at the Mardis Gras-themed celebration, which was scheduled to keep rocking until 2 a.m. local time"". 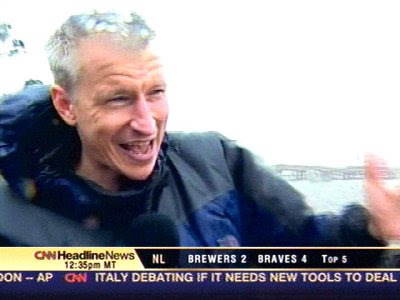 In other more serious news Wolf and Anderson talkedabout the threat of Hurricane Gustaf and AC revealed that he is heading to NOLA on Friday morning. Anderson again mentioned plans for his trip when he discussed NOLA's evacuation plans with Mayor Ray Nagin. I wanted to add this clip because Leslie Sanchez was discussed (and not too fondly) in comments on yesterday's blog. I found her opinions on Michelle Obama's appearance so bitchy and catty. when she talked with John Roberts on Wednesday morning. that I almost couldn't believe what I was hearing. This is just a snippet of her commentary. 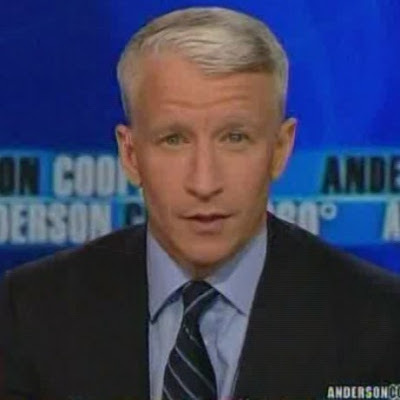 We found another interview that Anderson did while in Denver. This one was for CBS's school videos and talks a bit about AC's favorite section of the Constitution. 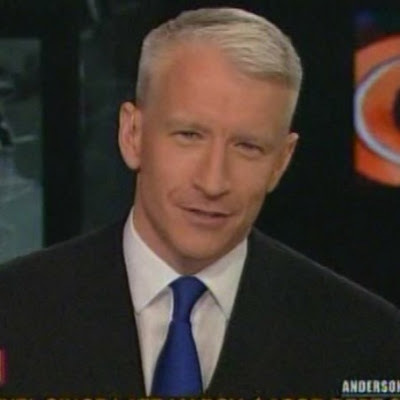 And finally tonight I'd like to thank DAFan for sending us some new pictures of Anderson from Denver. A few are high res and can be enlarged, all were found on Flickr. Enjoy! Thanks to Book Asylum, Sapphire and Cyn for help with research and clipping. And thanks to all of you for the interesting conversation the last few days in comments. I was dreading this week, thinking it was going to be hard to blog about. It has been just the opposite, almost too much material to cover. There was a lot of drama on Tuesday night, and I don't mean on the convention floor. I knew something was up when my email went crazy dinging over and over. 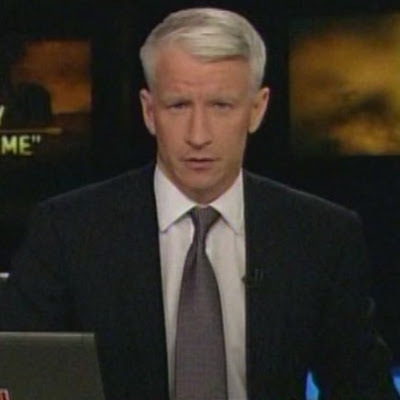 I stopped what I was doing, turned on CNN and started to worry with the rest of you. 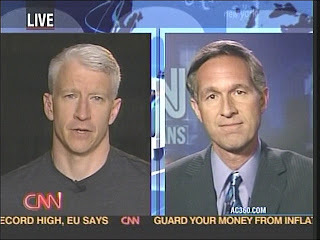 Where was Anderson Cooper and why was Campbell in Denver instead of NYC, as was the original plan? Many of my emails expressed concern that AC was called back to NYC on a family emergency or even a few wondered if he was angry at playing second fiddle to Wolf (not something that is likely, imo). CNN isn't talking (I tried) but here is my best guess. 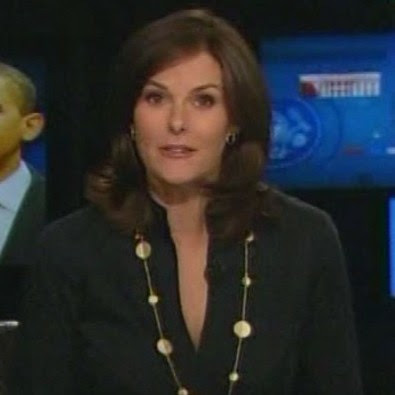 It was a stupid idea to have Campbell in NYC....she didn't get much airtime and the Denver anchors directed their questions directly to those in NYC, they didn't need a middle man (or woman, in this case). Since CNN seems hell bent on pushing Campbell front and center they realized that would only happen if she was in Denver. That's my theory, anyone have a better one? And does that mean AC will be in St. Paul with the Repugs along with Campbell? We've got some great pictures and a couple of videos to share with you tonight so let's get to it. I'll start with some unfinished business from last night. Did anyone catch sight of Donna Brazile (AC's boo) dancing with Paul Begala? No...you missed it? 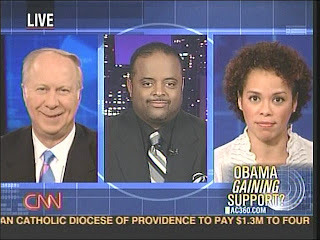 Well check out Jeanie Moo's clip and enjoy the Dancing Dems (including Roland Martin). 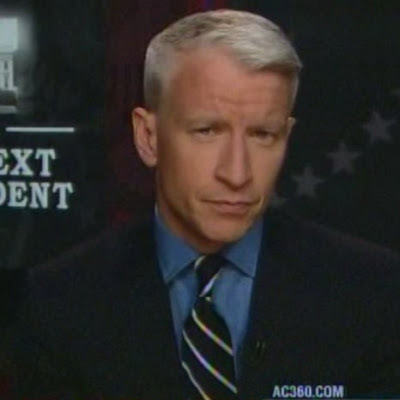 Next up is a little interview Anderson Cooper did yesterday in the CNN Grill. Did anyone know that AC wanted a bar mitzvah as an eighth grader? One little problem.......he's Christian. Anderson even went as far as memorizing the Haftarah and still can recite it as proved in this video. Enjoy! 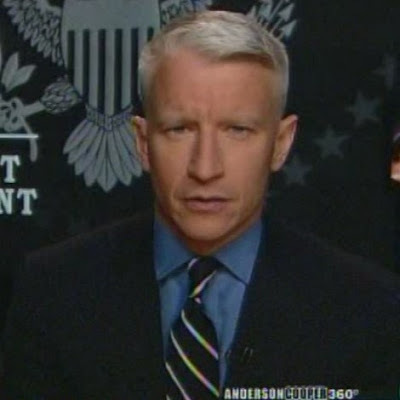 If you went looking around the Internet on Tuesday for some AC news you probably saw that he taped a guest appearance for The Daily Show. Here is a video of part of the taping. We'll record and post the segment when it airs. And a few pictures of Anderson with some of the TDS cast. For those of you who requested the clip of Caroline Kennedy Schlossberg joining the BPTOT ...here it is. And here are some CNN pictures from Monday evening's Democratic National Convention. The pictures are high resolution they will enlarge when you click on them. I hope all of you watched Senator Clinton's speech on Tuesday evening? As a HRC supporter you can bet I did and I was very pleased. She did a fabulous job and hopefully convinced her delegates and voters to jump on the Obama bandwagon. 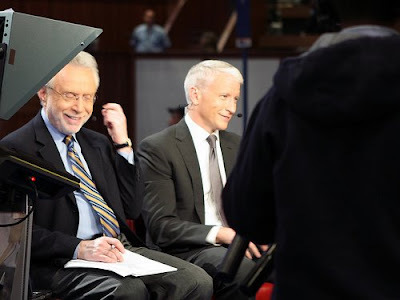 As we learned on primary nights, marathon coverage of events never give us as much of Anderson as the normal single-hour program does. 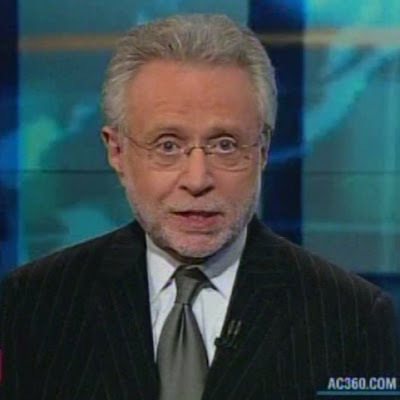 He is, in fact, more or less co-anchoring with Wolf Blitzer this evening. So I'm pulling clips as they strike me, we'll see how late we go tonight. 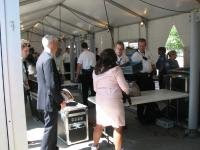 Denver -- Game on at the Democratic convention here, and the first order of biz is going through security. 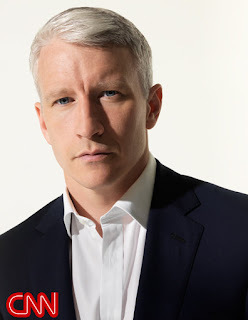 Everybody has to -- even CNN's Anderson Cooper. He was in line next to me and we chatted extensively about it. Me: Even you gotta stand in line? We'll see how the Tuesday fireworks go, but Day 1 was certainly a success from CNN's vantage point. Now, can we get a screen put up behind these guys so we don't have to watch people waving at the camera? Please? Ms. Quitty found a few pictures of Anderson taken yesterday in the convention center on Flickr. 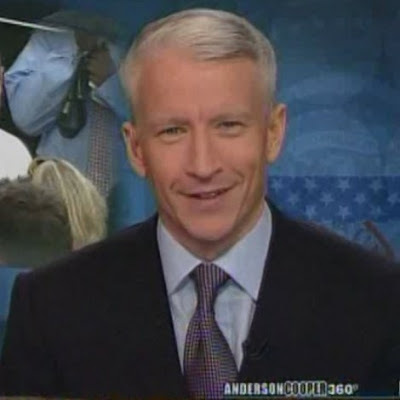 If you put those last two pictures together, you almost get a 360 of Anderson! Green checks represent blog posts by Anderson. 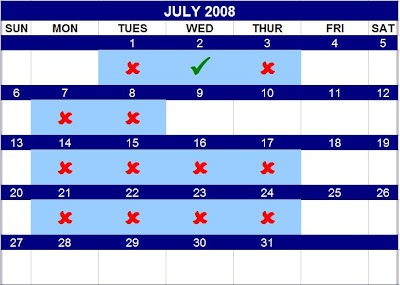 Days highlighted in blue represent nights that Anderson participated in the live blogging. 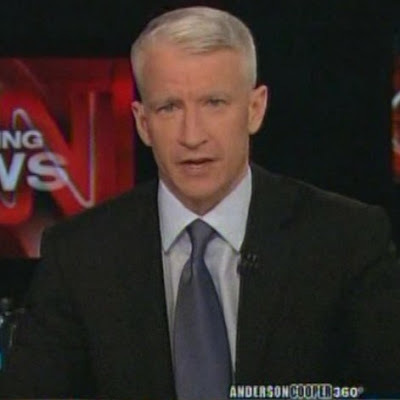 Anderson is no longer in the top 5 contributors in 2008. But he's holding on as the top contributor to the blog since it was created. 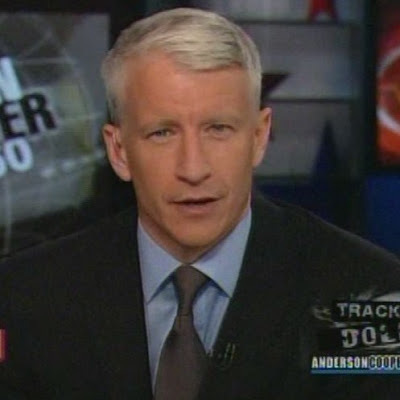 It should come as no surprise that this week's 360 in :60 has no Anderson in it. 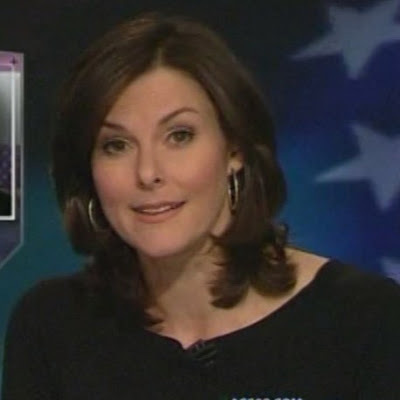 I have four episodes for you- all with Erica Hill. 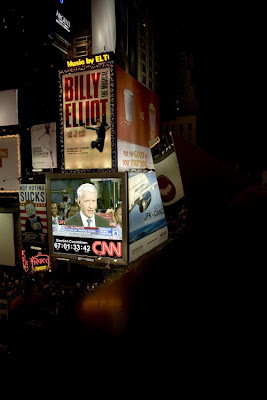 The puzzle this week comes from the New York Times ad that CNN ran several weeks ago promoting AC360. I had a little bit of fun with the picture before turning into a puzzle. The July 2008 Cooper & Co Calendar will be posted in the post below this one. 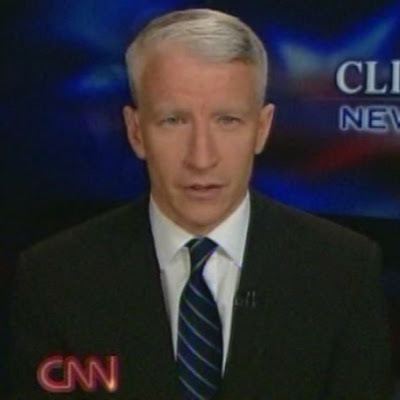 Anderson appeared live on 13 broadcasts. 3 additional nights, were anchored by him, but were prerecorded programs.